This article explains some very basic things about solar lighting that you probably already know, as well as some things I've tried recently. It's not really a reference document; rather it's meant to be a source of ideas and encouragement to try similar projects yourself. I have never had an "open house" at night until this year. So the fact that I had very little lighting on my railroad never bothered me. But this past July, we had a birthday party in the back yard, and the trains were running after dark, and all you could see on the railroad were the locomotive headlights and the lighting in the passenger coaches, circling like electric eels in the darkness. Well, there was a "solar" lighthouse I had got from Meijer's when they closed out their lawn "art." 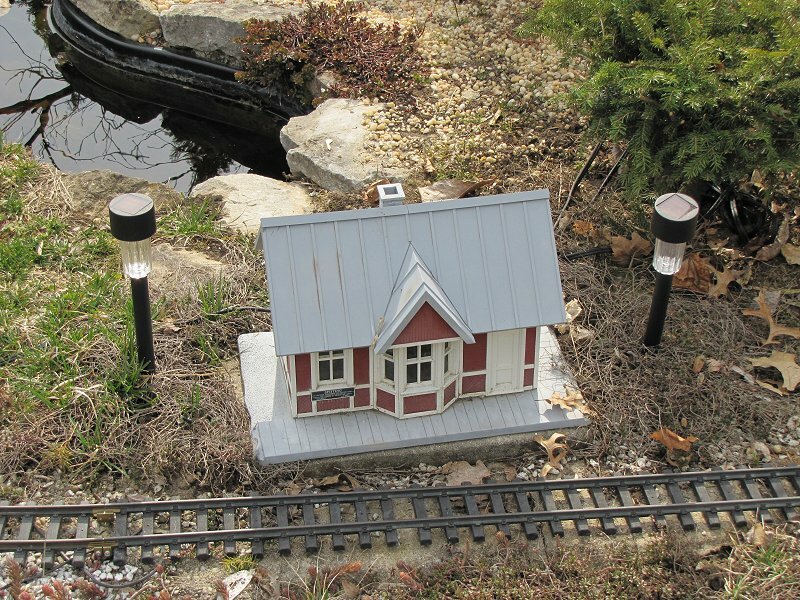 I've had reasonable luck with solar lamps at other places in the yard, but I've avoided solar lamps on my railroad because I thought they would look goofy. 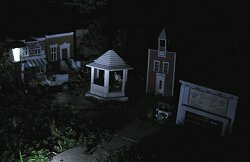 The "black plastic flying saucer" motif has never appealed to me, and even the least objectionable lights, shape-wise would take up too visual "space" on my garden railroad compared to the amount of light they shed. Also, many solar lamps don't illuminate, really; they glow. So you can see where the lamps are, but you can't really see much around them, which somewhat defeats a major purpose of lighting, in my opinion. Still, I thought it was time to experiment. Maybe being able to see where my railroad IS would be a start. So I started keeping an eye out for something small I could use in a pinch. This article tells what I found and what I still plan to try. By the way, I also bought a low-voltage starter set, but I figured I'd want to try solar anyway for the towns and buildings that are in out-of-the way places, so I started with solar. When I've made enough mistakes with the low-voltage lighing project, I'll report back about that, too. Update for January, 2009: A "tinkerer" friend of mine sent me some more detailed, but practical information about LEDs and solar circuits that charge them, so I've attached it at the end of this article. Enjoy. 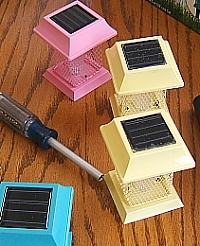 Solar garden lamps promise A: convenience, and B: energy savings, compared to other technologies, such as 12-volt lighting. I think they deliver on convenience, as long as you buy the right product for the job you want it to do. On the other hand, I'm not sure that they really "save energy" in the long run - chances are it takes more energy to make one of these devices than they'll ever give back. (Anybody who knows otherwise, feel free to correct me, as long as you have actual facts.) In this article we'll focus on the convenience aspect. Note: As more and more companies get into the market and as more uses for small solar lighting products are developed, we can expect to see incremental product improvements every year, and significant jumps every few years. So it's quite likely that everything in this article will be obsolete in a year, but that's okay, if it gives you something to think about or starts you experimenting. How Solar Garden Lamps Work - Most solar garden lights have a small solar panel that converts sunlight into a trickle of energy. That energy goes into a circuit that charges a Ni-Cad battery. They also have a light sensor (sometimes built into the solar panel) that tells the circuit when it's dark out, so the circuit knows to stop charging and start sending electricity to the LED. An LED - "Light-Emitting-Diode" - is a small mostly plastic electronic device that glows when it receives low voltage DC. It actually gives way more light per volt than a traditional filament bulb, so it's well suited for solar garden lights. Because the LED is so small, its bright pinpoint casts razor-sharp shadows and can keep your eyes from adjusting to the darkness if you look right at it. So most solar lamps use a diffuser of some sort to "spread out" the light a little. The black plastic flying saucers just use a milky outer shell that, unfortunately, causes the lamp to glow rather than to shine on other objects. 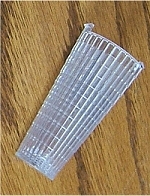 Many of those that use clear "panes" (like the carriage light shown above) use a plastic tube with lots of crystal shapes molded into it to distribute the light over a larger area. In most cases, this leaves the carriage lights looking like they're powered by radioactive carrots, which is not necessarily a natural look, either. But such lights do allow more of the light to escape than the black plastic flying saucers do, so the best of them light their surroundings a little. Most Solar Garden Lamps Use Weak Rechargeables - Now, the solar panels are more efficient than they were just a few years ago, which is a good thing. On the other hand, NiCad batteries are a relatively weak technology compared to the NiMH batteries being used in most rechargeable devices today, so there IS a practical limit to just how much power a solar garden lamp can store using a NiCad battery or two. Most Solar Garden Lamps Now Use A Brighter, but Less Natural-Looking Light Source - For years, solar garden lamps used LEDs that gave off a warm yellow light they usually called "amber." The light from amber LEDs is pretty dim, but it does look relatively "natural," as though it came from a gaslight or candle. Today, most solar garden lamps today use "bright white" LEDs that give off a light that's almost as blue as the old mercury vapor streetlights. Many of the new lamps give more light than their predecessors, but anything they illuminate looks relatively "cold and lifeless." What About Using Solar Lamp Parts to Light Buildings? 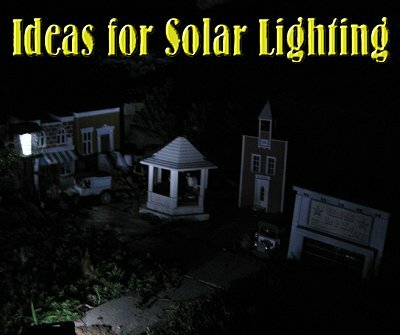 - I've thought about trying to use the parts from a solar garden lamp to light building interiors, etc. I think it's possible, if you could put the solar cell someplace inconspicuous, and run wires to the circuit. 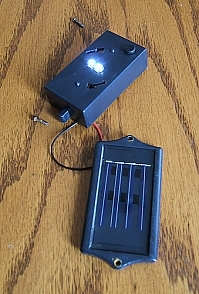 But on many solar garden lights I checked out, the solar cell is glued to the plastic framework and its leads are soldered right to the circuit board, so you'd run the risk of damaging it if you tried to get the solar cell detached from the rest of the thing. Yes, if I had much more time on my hands, and as much proclivity to solder and unsolder things as I did when I was twenty, I could do it, but I already have enough "serious" projects on hand. I did find one set, a sort of solar metal "lumiere" that had a solar cell that just screwed on and had real wires going between the solar cell and and the circuit, so I can lengthen the wires and give that a try. 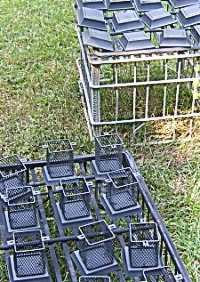 This may seem to beg the question, why not just buy the parts separately and do it all yourself? The answer is that, due to Chinese manufacture of the lamps, it's cheaper to buy a whole lamp and throw away everything but the electronics than it is to buy only the parts you need. Especially if you can get the lamps at an end-of-season clearance. How Can You Tell if a Solar Lamp is Good or Not? - Another issue is that you can't tell how much light a solar lamp will give or how long it will stay lit just by looking at it in the store. My limited experience shows that lamps that have more than one LED are brighter, and they don't necessarily go out any sooner. Also, lamps that have 2 batteries tend to brighter and last longer than lamps that only have one battery. Generally, though, you won't get into a lamp that has multiple LEDs and multiple batteries unless it also has an expensive "carriage light" framework or the like that you'll have to discard. In a couple of years, even the cheap ones may be as bright as the expensive ones, so if all you can afford to "cannibalize" right now are the cheap ones, experiment with those. In fact, every solar garden lamp I own, I got at the end-of-season closeouts, which is one reason I'm putting this article up in late summer. Again, most solar garden lamps that are shaped anything like street lights are too big to use regardless. After all the designers aren't thinking about what garden railroaders need. And the solar cell forces the things to be at least a certain dimension. That said, in 2007, Big Lots sold a set of "cheapies" that were smaller than average - the solar cell took up most of the top. One advantage to them was the fact that instead of being eight times too large for my railroad , they are only about four times too large. No, they won't fool anyone into thinking they were scale, but they won't visually take over the space, either. These lamps used a wire mesh instead of the more typical glass or plastic panes, but the effect is not objectionable. At first Big Lots had these lights listed for $20 for a set of four. At the end of the season, they marked them down to $9 a set. No-brainer time. I got two sets and set out a few to see if they would a: Illuminate as well as glow, and b: be small enough not to take over my railroad visually. They did illuminate a little. And in a way I could see the benefit of the brightly colored screens - enough light was reflected from the inside of each screen to give the glow a slight green, yellow, pink, or aquamarine cast - something that might be of interest to a person who wanted colored lights in the back yard. Actually, the lights with the yellow screens looked more "organic" than the rest - the yellow screens seemed to balance out the bluish-white a little. I was tempted to leave the screens on the yellow lights yellow, but decided that having all the lamps the same color was more important. Big lots will probably never have this particular set again, but this is to give you an idea of what is possible. Getting Rid of the Party Colors - I also pulled one lamp completely apart and decided to try to work with the basic structure of the thing instead of trying to come up with something clever. However, the colors had to go. So I took them apart and masked off the LEDs. About half of them had a piece of protective vinyl over the solar panel. On the ones that didn't, I masked off the panel as well, holding my breath that the tape wouldn't damage the solar panel in any way (it didn't). By the way, I didn't take photos the first time I did this so these photos are actually from the seond batch. 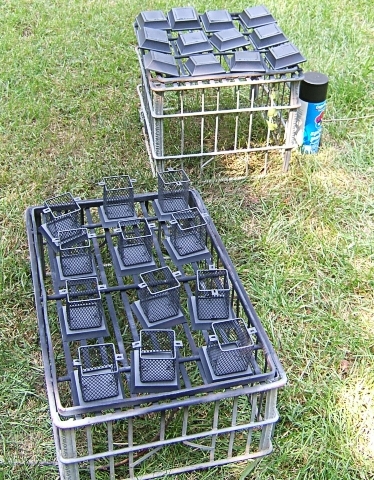 Then I took the lamps out to my favorite "painting booth" (a collection of old milk cartons in the rear part of the back yard) and sprayed them from every angle twice. Again, these photos are actually from the second batch. Finally, I reassembled the lamps, then got out the "bases." These were black, fluted tubes. One end could be pressed into the base of the lamp unit, and the other end fit over the top of a stake that was similar to the stakes on low-voltage lighting. After I assembled the first one and tried to stick the stake part into the ground, I remembered that it hadn't rained in months. So I took the stake part out and hammered it into the ground, trying to keep it straight. Then I put the rest of the fixture on top of the stake. As you can see in the title photo, I tried to set these so they would illuminate the structures in my towns without obscuring the view from the most likely viewing positions. The results were not universally successful - I discovered that the lamp had to be pretty close to illuminate anything. And also, the "best" placement for the lamp, lighting-wise, was often the worst placement, aesthetically. Still, the results were generally positive. There was no question that I could use another eight or so if I wanted to do it "right." So I wound up "kicking myself" for not buying all they had. Later I did get three more sets from another Big Lots store, so now I probably have more than enough. One lamp from the first batch seemed to work intermittently. 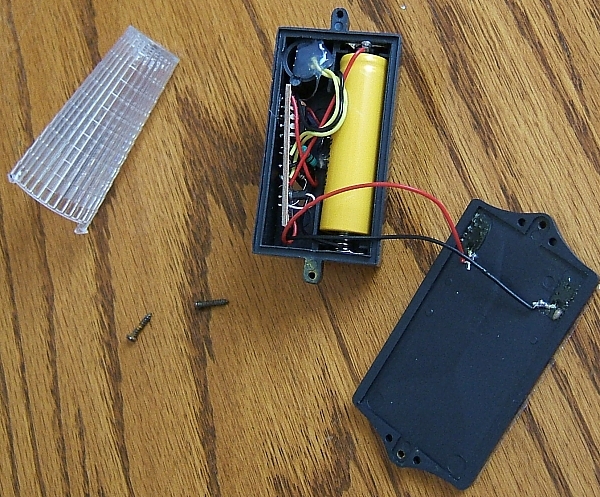 After disassembling it again, I discovered that the battery was loose, so I wedged it in a little tighter. Still, they do all come on at slightly different times (based on when the "deep shade" hits each individual lamp), and they all go off at way different times (based on which ones got the most direct sunlight during the day). At the best, they're good for three or four hours after dark, compared to some of the fancier two-battery lights I have that will go up to ten hours. But since I usually run my trains in the summer (when it doesn't get dark until 8:30 or 9:00PM), that pretty well covers the hours I need them anyway. You can see the lamps glowing from across the yard, but it's a little hard to see exactly what they are illuminating until your eyes have adjusted to the darkness. The illumination they do provide is faint and bluish-white, much like pale moonlight, or, frankly, like the mercury vapor street-lamps in some cities today. 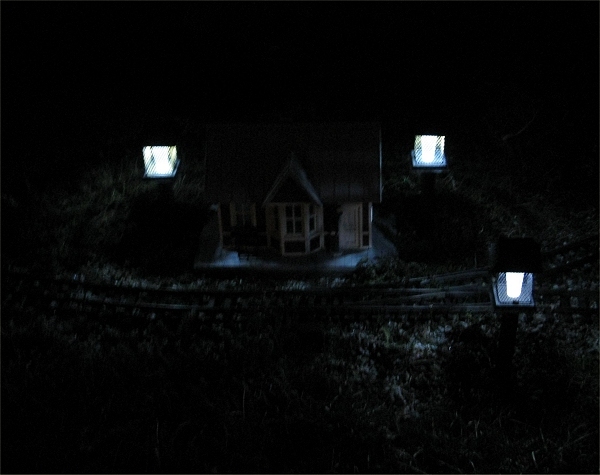 If you want your railroad at night to look "warm and welcoming" rather than "cold," consider adding some component, such as warm interior lighting, to balance out the effect. In the case of these particular lamps, I can't help but remember how the yellow screen made the light seem a little more natural from the inside. I may investigate the possibility of painting just the inside of the screens yellow on the ones that are still apart, and see if that helps the overall look. On the "bright side" (pardon the pun), I can move these around wherever I want them, and I don't have to worry about timers or burying low-voltage wires. There is something nice about coming home after dark and seeing my little communities lit up. Yes, I could accomplish the same thing with low-voltage lighting, and the effect would probably be better, but the process could not be easier. In the illustration of the night scene I've included, you can get a general idea. There are two "storefronts, surrounded by greenery. In front of them is one of those little Ertle trucks parked on the street, and in front of that is a gazebo. After I started working with this photo, I noticed that the building on the right has a little bit of interior lighting. Then I remembered that I stuck one of those units from the lumieres onto the back of the building (which is open), so that the solar cell was sticking out and the diffuser was sticking in. Still, the diffuser is in the top of the building, so it's not shedding much light near the windows. To do this "right," I need to position the LED and diffuser better, and also glaze the window, and maybe provide curtains or something else to soften the blueish-white light. Still it establishes that it "can be done" (if you don't mind spending an average of $4 per building to do it, as the lumieres cost on clearance). I left these lamps out over the winter. One of them "gave up the ghost," but the others are still working. I DID notict that they only give an average of 3-4 hours a night, less than three if the day was gloomy. This isn't a problem in the summer, when they don't even kick in until 9:00PM or later. But in the winter, when they kick in at 5:30 and give out by 8:30 or so, they are somewhat less expressive. 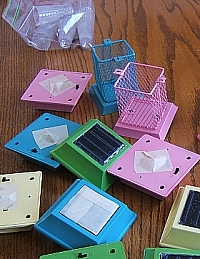 On the next batch of these, I tried to make the lamps' light look slightly more organic by spraying the inside of the screens yellow before I put them back together. 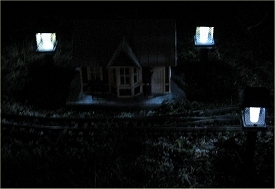 In the photo to the lower right, the lamps on each side of the station have been treated with the yellow treatment; the one in front has not. You can see that the difference is marginal, but it still helps a bit. A test I didn't expect was during a power outage that was caused by Hurricane Ivan's last gasp in Ohio. In addition to the little lights I experimented with above, I had two larger lights that had two batteries in each and which generally stay on for ten hours or so. These sit on the posts of the hand-rail leading to the deck by our above-ground swimming pool. When the power went out and stayed out, I unscrewed those lights and brougth them in. In addition to our collection of candles, they gave us enough light to brush our teeth and go to bed. Then the power came back on at three in the morning. I had some other two-battery lamps in a box that, quite obviously, weren't charged. Had the power been off the next morning, I would have got them out and set them out to charge during the daylight. So there are advantages to solar lighting I hadn't even considered when I started this article. Then a few days later at Odd Lots, I saw two of the little rock-shaped lights that are supposed to be like little floodlights. I hadn't bought any yet, because they're made so that if you have the "floodlight" part aiming away from you, the solar panel is on the side you see. Duh. And several solar "floodlights" I investigated years ago were a joke. But for half price, I thought I'd give them a shot. I was pleasantly surprised. 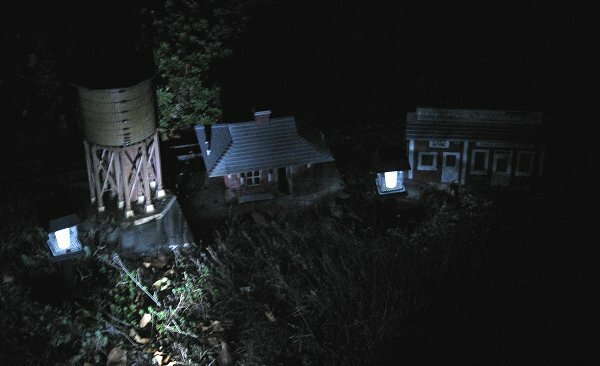 Fully charged, each of them gives about as much light as one of those pen-sized pocket lights, not enough to illuminate a wide area, but enough to provide a "bright moonlight" effect on a small town or farm scene, etc. Like the more traditional lamps with the bright white LEDs, these provide a "moonlight" or "mercury light" effect that washes out color. Each rock has four "bright white" LEDs. I'd rather they had three "bright white" and one amber LED just to provide a slightly more natural lighting effect. 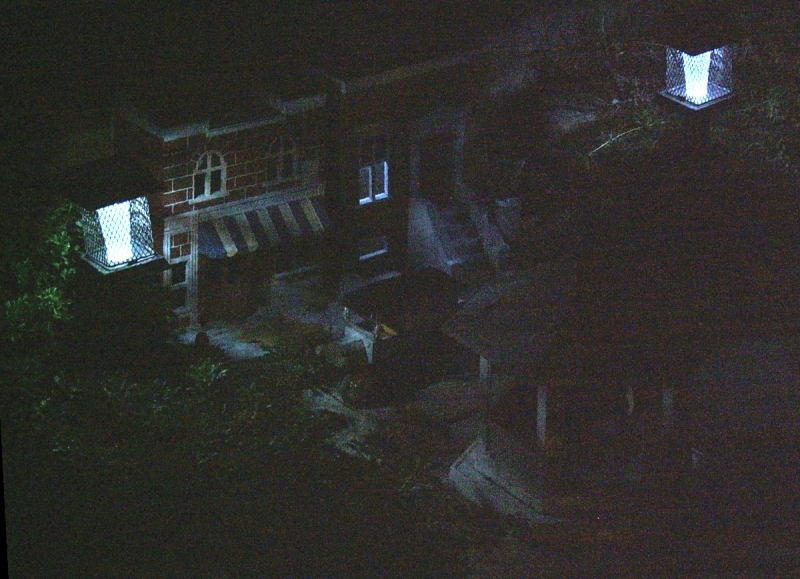 The ones I bought shoot somewhat upward, so that I had to set them on about a 30-degree slope to get them to illuminate stuff on the ground. I put one behind a "barn" so that you can't see it at all from normal viewing positions. The other one I left "out" but I'll try to to figure out how to shield the solar panel at least a little from view. I found some more solutions, including some relatively skinny path lamps made possible by half-length AA cells that cost more to replace than the fixtures cost now. 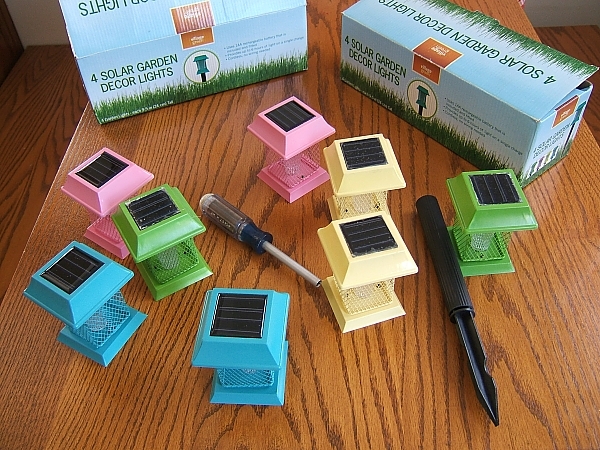 There is a review of those, plus some other notes in our Solar Lighting Update, 2013. Hopefully, I will have more ideas and information about solar lighting soon. But I wanted to get the basic article started just to encourage folks to try something along this line themselves. You would be surprised HOW many of these articles have given rise to a whole new "standard" way of doing things over the years. In the meantime, I have to confess that being able to see my railroad, even a little bit when I pull into the driveway after dark is kind of fun. It's a little like the little communities have decided to "leave the light on for me." Obviously, if you've done something that outshines our feeble attempts, please let us know and we'll publish any ideas and photos we get from folks. I applaud your efforts with solar lighting and wish to add a bit of my experience. 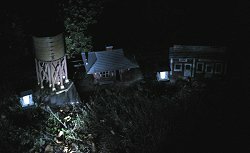 Although I've only put solar lighting into two of my RR buildings, I've tried numerous brands of solar lighting around my yard. To this end, I've yet to find any manufacturer's product that lasts more than a few months before giving up. Often the supplied battery goes bad and when replaced, the unit never works as original. More often than not, the electronics merely quits, either from moisture of my sprinklers or just poor engineering design. The only success I've had was using a formal 5 watt solar panel to daily charge a deep cycle battery which is wired to the lights. Not quite the simplicity one would like in this type of effort. Hence, I'm going to wait to hear a couple testimonials from someone who actually claims they've used a "store bought" system for more than a few months. Another grand issue, thank you. I have a comment on the Out Door Lighting thread. We have purchased for Anozira RR some LED, bullet shaped, spot lights, which we have tested mounted on a pole to illuminate segments of the pike. As being spot lights, they shine down on the track areas, flooding light to where one needs to see. Experimentation with height above the ground, the angle to set each bullet-lamp, and how many lamps per pole to effect the coverage required is simply an exercise of diligence. We have found that the floods illuminate the track and way such that train operations are easily seen and the walk areas are lighted also, and unobtrusively well that folks can move about in safety with out stumbling, tripping, and going where they should not. We have invested in two types of flood lamps: a Malibu, model LZ413, set of 3 each, 3 LED bulbs per lamp, energized by one solar cell array; AND another Malibu model having 1 each light comprised of 6 LED lamps energized by one solar cell array. Each lamp in 3 LED bulb/light set is not as bright as the 6 bulb lamp, which makes the light flooded area more subdued/softer, but also each 3 LED lamp will not illuminate as much area. 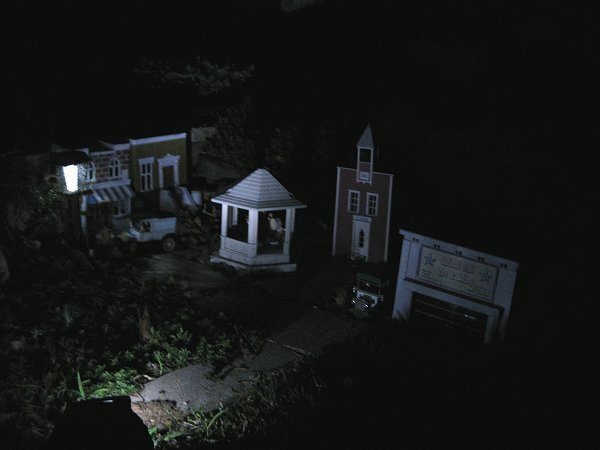 However, since there are 3 lamps in the set, one can mount them to illuminate a much wider expanse of area. That is kind of nice too because each lamp can be set to either blend with its neighbors, or set to illuminate spots with darker areas in between lighted spots. Interesting to watch a train pass from one lighted spot to the next, sort of like going through a connecting tunnel. 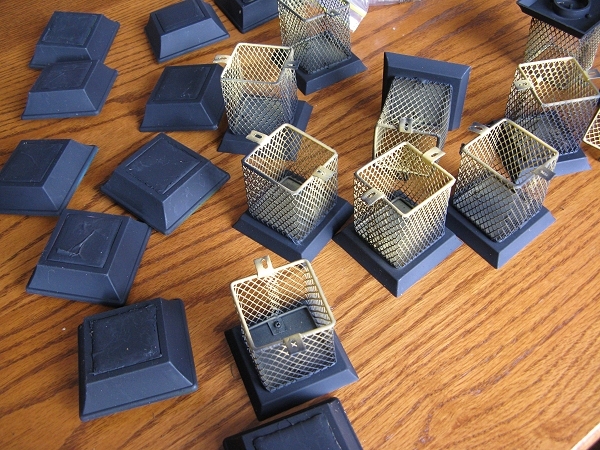 The light housing are flat black. 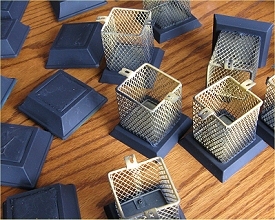 We are to mount the lamp(s) on steel poles that are the pipes used in home situation, chain link fencing. So all the hardware is easy to acquire from Lowes or Home Depot to make the poles look stylish such as the fennel on end, clamps upon which to affix each lamp array. All are galvanized. All available in different diameters and lengths. I have not installed any yet as our Tucson weather has been too hot for me to be messing with the RR much. With reference to page located at http://familygardentrains.com/primer/lighting/solar/solar.htm detailing using cheap Chinese solar lanterns for illuminating model railroad layouts - two undesired features are mentioned as problems: short runtime of the lights, and unattractive color of the lanterns. Both of these are rectifiable with a few extra parts and a little elbow grease, for those who have the time or inclination. 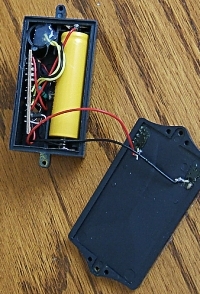 Poor runtime is often caused by deterioration of a low-capacity NiCd rechargeable AA cell in the lights - as the solar light is a low-power device and the different chemistries can trickle-charge the same way, in most cases a AA NiMH cell is a drop-in replacement and will power the light all night (assuming the solar cell supplies enough power to charge the cell sufficiently during a day). The colour of the light can be altered by swapping out the LED. "White" LEDs are actually high-intensity blue LEDs with a thin coating of phosphor over the LED chip - this phosphor absorbs some of the blue light and fluoresces red and green, to produce a semblance of full-spectrum white light. As you'd imagine, the thickness of the phosphor is critical, too much and the light is too yellow, too little and the light is too bluish. White LEDs after manufacture are often sorted into lots based on white purity, the ones that aren't pure white are sold cheaply and often used in these lamps to shave a few more (fractions of) a cent off the purchase cost. White LEDs with too much phosphor are sold as "warm whites" for those who prefer a yellowish cast to their light. If you (know someone who) can use a soldering iron, you can easily replace the supplied LED with a whiter or yellower white LED for a nicer effect (make sure the replacement is around the same way as the original, as LEDs only work one way, unlike torch bulbs). If desired, you could instead put in a blue or possibly even a "UV" LED for special effects. Red, pure yellow or green LEDs like a lower feeding voltage and probably won't work or will fail quickly if used in this way, however (though they may last - haven't tried a swap myself yet!). White LEDs with a pure or yellow cast can be obtained from places like eBay, or suitable (defunct?) consumer products like torches that have the colour you are looking for. Salvaged LEDs often don't have the long leads, but pieces of insulated wire can replace these. Don't heat the LED too much with the soldering iron if you try this, or you might damage it. I asked Vince whether it was safe to use NiMH batteries in a solar circuit meant to charge Ni-Cads, and he sent the following reply: When charged with high currents (e.g 2hr or 1hr chargers), it is correct that you need a charger that knows how to treat the different chemistries of NiCd and NiMH cells, as they do somewhat different things when they get full, and a NiCd-only fast charger could indeed dump enough energy into a NiMH cell to cause it to overheat and pop. Containing water, if they get too hot the water boils and turns into steam with a massive increase in cell internal pressure, which can indeed lead to rupture or explosion, though the cells should be safety vented these days so they instead just leak their corrosive guts all over the place and into the innards of your charger instead. :) They don't tend to work as well at storing charge afterward! Extended trickle charging is somewhat bad for NiMH cells, but only at relatively high current levels (say > 5% of battery capacity/hr). It would take a beefy garden light solar cell and a puny AAA NiMH cell to get near that limit, and the cell should be discharged mostly or completely overnight anyway. As the solar cell would be about the most expensive component, most designs are likely to be limited in night runtime by the low output of the solar cell rather than limited capacity of the battery. The highest output solar cell on a lantern I've seen is 30mA and even this relatively high current is unlikely to damage a 600mAh AAA cell applied continuously (as opposed to intermittently, for 8-12 hrs per day). Modern cells contain chemicals to eliminate gas buildup under extended trickle charging - the energy is converted to heat instead, and under low currents like what a garden light solar cell supplies, the cell can't get hot enough to be damaged. Long story short - a garden light isn't a microprocessor controlled charge station and isn't designed to baby the battery to get the theoretical limit of approx 1000 discharge cycles, so don't be surprised when the batteries crap out after a year or two, no matter the chemistry - but the low charge currents from the solar cell pose little risk of overcharge damage to a NiMH cell. One note: if the solar cell doesn't output enough current to fully charge even a low-capacity NiCd cell, swapping in a NiMH cell won't give you any extra runtime. 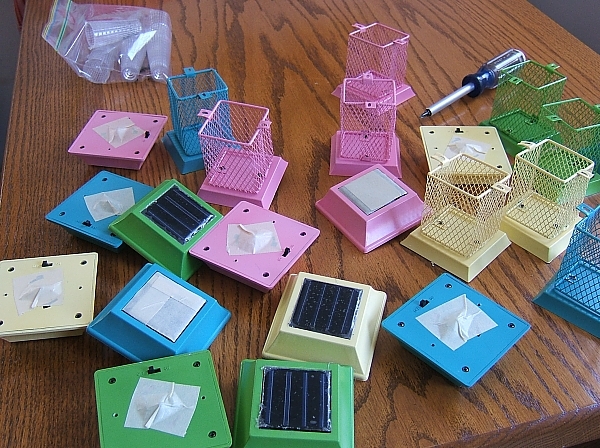 If you need to replace dead cells, NiCds are cheaper, your solar lantern is weak, and you can recycle the toxic dead NiCds - those are the ones to go for! Where I live, NiCds are difficult to buy new, and only fractionally cheaper than similar physical size NiMH cells with twice to three times the capacity and no toxicity, so I'd generally go NiMH without a thought, but "your mileage may vary."